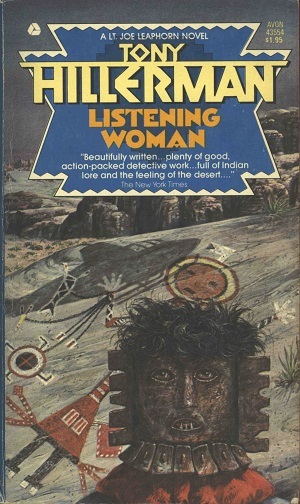 The first of three Avon paperback editions of Listening Woman to come out in 1979, this edition the only one printed in the US. The cover design, unattributed, is dominated by what may be a representation of a kachina mask, a cultural misattribution, as the novel is about the Navajo. Binding: Pasteboard with full-color illustration on front cover. A turquoise cartouche inset present the title and author's name. The spine replicates the turquoise color of the cartouche, and the novel's title and Hillerman's name are read horizontally along the length of the spine.